If you continue to use PSI website without taking action to prevent the storage of cookies on your computer or mobile device, you are effectively agreeing to this use. 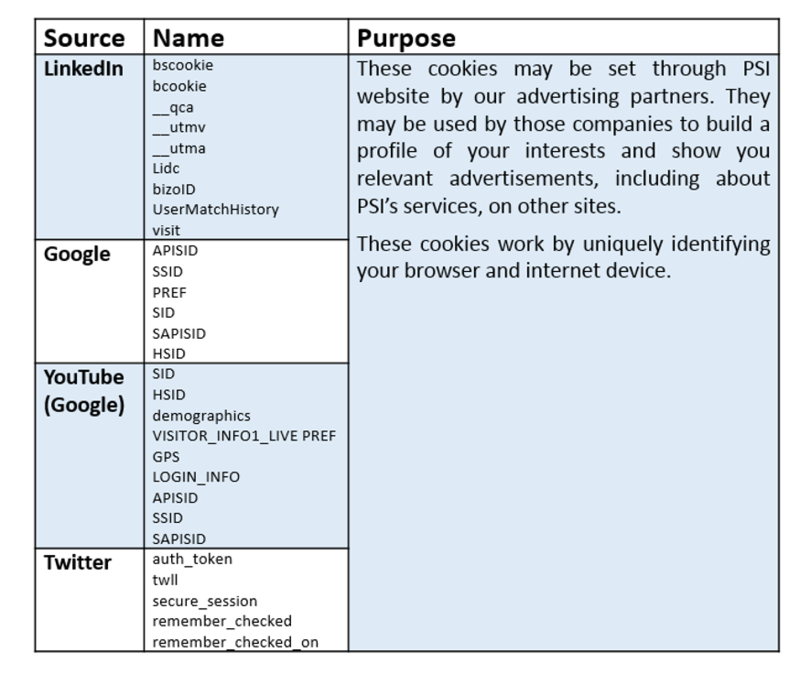 Below is a list of the different types of cookies used on PSI website, and an explanation of what they are used for. These cookies are necessary for the website to function. They are set only in response to your requests for information/website services, e.g., filling in forms. If you choose to block these cookies some of the information you will try to access via PSI website may not be accessible. If you do not allow these cookies, we will not be able to include the information about you visiting PSI website into the statistics of the site performance. If you do not allow these cookies, some or all of the website functionalities may not work properly. Any data collected through cookies will be used in accordance with PSI Data Protection Policy and the privacy policies of our partners.If you do not allow targeting cookies, you will receive less targeted advertising. If you would like to get more information, please contact PSI Data Protection Officer at privacy@psi-cro.com.